VANCOUVER, BRITISH COLUMBIA--(Marketwired - April 18, 2017) - American Lithium Corp. (TSX VENTURE:LI)(OTCQB:LIACF)(FRANKFURT:5LA)(WKN:A2AHEL) ("American Lithium"; or, the "Company") is pleased to announce brine sample assay results from near surface auger sampling and brine and sediment samples for shallow sonic drilling on the North Playa, Fish Lake Valley, Esmeralda County, Nevada. For more information, please visit our website at www.americanlithiumcorp.com. American Lithium Corp. is actively engaged in the acquisition, exploration and development of lithium deposits within mining-friendly jurisdictions throughout the Americas. 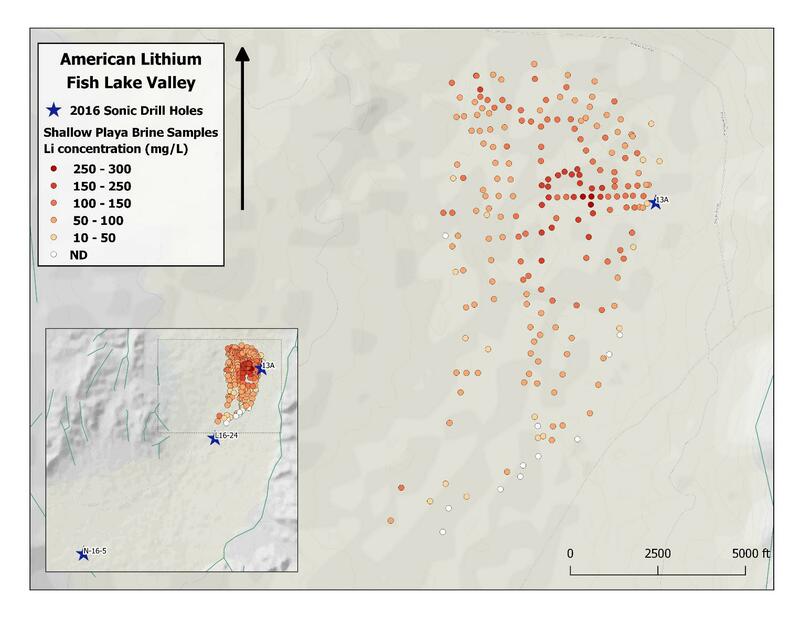 American Lithium holds options to acquire Nevada lithium brine claims totaling 22,332 acres (9,038 ha), including 18,552 contiguous acres (7,508 ha) in Fish Lake Valley, Esmeralda County; 2,240 acre (907 ha) San Emidio Project in Washoe County; and the 1,540 acre (623 ha) Clayton-Valley-1 Project. The Company's Fish Lake Valley lithium brine properties are located approximately 38 kilometers from Albemarle's Silver Peak, the largest lithium operation in the U.S. American Lithium is listed on the TSXV under the trading symbol "Li". For further information, please visit the Company's website at www.americanlithiumcorp.com. On behalf of the Board, American Lithium Corp.
About this company American Lithium Corp.